The Droid RAZR HD is coming. It’s yet to be announced, but several leaks foretell its coming. And the next Droid is set to go spec-to-spec with the Samsung Galaxy S III. This thing looks killer. The leaked pics show a device clearly born of the same DNA responsible for Motorola’s hottest Android models. The backside appears to be made of carbon fiber like the RAZR and RAZR MAXX. There are microUSB and microHDMI ports on the device’s side like on the Droid X/X2 and Bionic. The casing’s relatively thick casing is spurring rumors across the blogosphere that this model might even pack the RAZR MAXX’s massive 3000 mAh battery, which, if included, would give this Droid a significant selling point over the Samsung Galaxy S III. Per leaked benchmarks further detailed below, the screen is reportedly 1196×720 with several pixels likely dedicated to on-screen buttons. This is a significant step-up from the RAZR’s 540 x 960 screen and matches the Samsung Galaxy S III pixel for pixel. 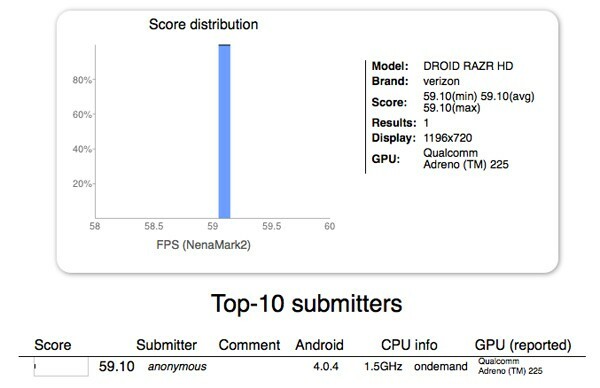 A stray Nenamark benchmark further details the upcoming phone, revealing its Snapdragon S4 dual-core heart running at 1.5GHz. Fanboys will be quick to point out that this is the same clock speed and chipset used in the SIII headed to Verizon, but the Droid RAZR HD reportedly only has 1GB of RAM where Samsung’s latest rocks 2GB. So far pricing and the target release date has yet to be announced (or leaked). That said, if Mr. Blurry Cam can get his hands on a unit, chances are the release is not that far out and considering the RAZR MAXX’s recent price drop, expect this model to cost either $249 or $299.